We all do it don’t we? This is the time of year that we reflect on the past year and we look forward with great anticipation for the year ahead. We get to start over. We become change agents for our own lives. There is definitely something special about this time of year that gives us a renewed sense of hope and inspiration. This is especially true in the education world. The holiday break gives educators the chance to reflect, recharge, refocus, and renew. As we head into a new year, I’d like to offer a few tips that can maximize the learning environments of our schools. Some of these are tested, tried, and true; while others may simply be my imagination running wild with optimism for better schools and a better world. We need to stop putting a time limit on learning. What if Thomas Edison was given a deadline for the light bulb? If we truly want to individualize the learning process for our children, “time” cannot be a major variable. Focus instead on mastering skills. When one skill is mastered move on to the next. Allow the students to own the learning process. Imagine for a second a school with no bells. Subjects such as science, math, language arts, and electives are all integrated. Students use the skills in each of those areas to solve real-world and relevant problems. The focus and assessments shift to the process and not so much fixated on an end result. Sounds a lot like growth mindset doesn’t it? You have heard of the four C’s. Creativity, collaboration, critical thinking, and communication are the four competencies that many educators believe are the gateway to producing a College and Career Ready student. I couldn’t agree more with this. The world in which we live now is such that new jobs are being invented every single day. Our students in elementary will likely take jobs that have not been invented yet. Even though these jobs might be a blur to us now, I can certainly guarantee that the competencies listed above will be a requirement for success. Our schools need to allow children to excel in these areas. I would also challenge schools to expand on the four C’s. With an ever changing world, we need to really hit on things such as character, confidence, compassion, and caring. We need to show students that they can make a difference in the world. We need to let them know that failure is okay, and give them the confidence to take risks and step outside their comfort zones. We need to engage in conversation with our students and let them know that we genuinely care for each of them. This is called relationship building and it’s the number one thing that an educator can do to ensure learning is taking place. Want a safe and secure school? If you want to keep your school safe, it does not start with arming educators or installing metal detectors at all doors. It starts by showing a genuine care and understanding for every single person in the building. Connect with each child. Let them know that you care about them and their well-being. As a matter of fact, this should be expanded beyond the walls of the school. What if we all were just a little bit nicer to others? What if we all extended a genuine care to every individual that crossed our path in a day? We can make society better simply by acting better. Will this end all violence? Absolutely not, but it should make a difference. The next step to this is to raise awareness for mental illnesses. We need to treat mental illness with the same magnitude that we do for other diseases such as cancer and dementia (to name a couple). My final tip for a successful new year revolves around the word desire. We don’t talk about this word too often, but it’s simply the fuel that keeps us going, or the lack thereof that keeps us in one place. We must desire to get better in every facet of life. We must continue to learn each and every day. We need to fail a few times, and desire to get back at it and do better. As educators we must desire to be better at our jobs. We must have desire for every one of our students to succeed. Administrators must have the desire to see each of his/her teachers flourish. We have to find that spark of desire and ignite it. 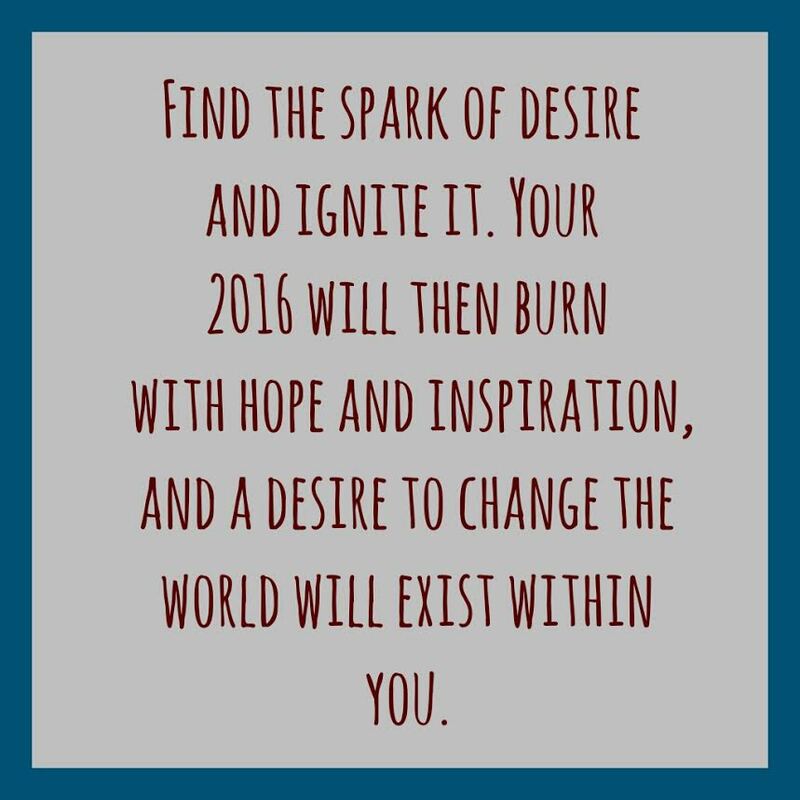 If you do this 2016 can burn with hope and inspiration and a desire to change the world will exist within you. Pretty simple right? There is nothing really fancy to it all. It’s a mindset change. Pull the oxygen mask over your face first. Take a couple of deep breaths and then improve the lives around you. I want to wish every one near and far a Happy New Year. May 2016 bring each of you joy and happiness, and may that joy and happiness be contagious to all of those you come in contact with.